The neighborhood was quiet when we first arrived at the Hub. “The Hub” is what we call the 200 square foot building we constructed at New Columbia to teach basic bike maintenance and safe riding skills. I was there with two fellow staff members, four Community Cycling Center volunteers, and four volunteers from New Columbia. As we set up our tools and bike stands, the first few kids arrived. “Can we play with the tire?” they asked. 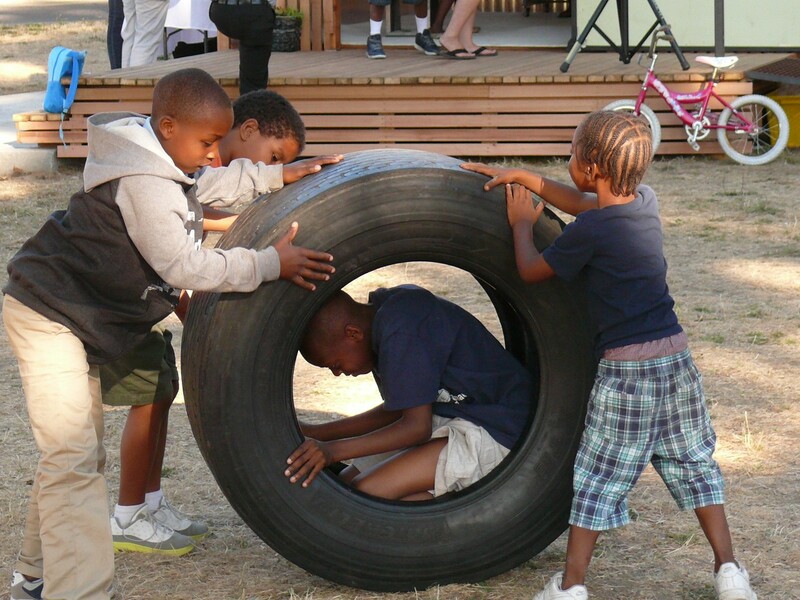 During the two week construction of the Hub this past August, neighborhood kids spent hours playing with a giant truck tire intended for (but ultimately not used in) a “bike tree” sculpture. This was the first time we had opened the doors since the ribbon cutting ceremony and soon a buzz of activity erupted all around us. People rode or rolled up bikes of all sorts to the registration table. Linda and Omar, our Programs team, passed around forms asking what repairs they needed and what they wanted to learn. They formed a line, and we helped them fix their bikes one at a time. First up was Jolante. He was a soft spoken young man of about ten years old. According to his form, his bike had a flat tire and a loose coaster cog. I guided him through the steps to reinstall his cog and put a patch on his tube, and only offered him physical help with some rusted axle nuts that wouldn’t budge. Afterwords, he pumped up both of his tires, ran down the ramp, and jumped directly on his bike. Next I met Ali. As we inspected his bike together, he told me that he had only lived in the neighborhood for about two months. He was about thirteen and not very talkative. He indicated that his chain kept falling off, and his rear wheel wobbled. I also noticed that all his bearing systems were a bit loose. Bearing adjustments takes some practice to get perfect, but following my instructions, and with what seemed like little effort, he got them running smoothly. Muse (pronounced Moose-ah) looked a bit bored when I walked up to him, but when he realized it was his turn, a big grin spread across his face. “You helped build this,” he said, recognizing me. “So did you,” I replied. Muse and I had met during the construction of the Hub when he helped me dig a hole for one of the building’s posts. “What’s going on with your bike?” What wasn’t going on with his bike. He told me someone had stolen it, and his dad had found it again. He wanted to fix it up so that someone in his family could ride it. Muse worked quickly and proficiently. I pointed out the issues, explained how to fix them, and he went at it. For the first time that day, I leaned against the work bench and took a drink of water. “You’re really good at this,” I said, sincerely impressed. “I want to work here,” was his reply. I told him there might be employment opportunities in the future, and made a mental note to remember his name, Muse. At the end of the day we loaded up our little pick-up to head back to the bike shop. 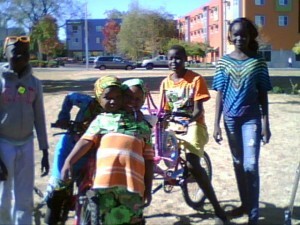 As I stepped into the truck, Jolante rode by with a small group of kids. “Bye, Jonnie,” he yelled. I just smiled and waved.